WinStar Farm, China Horse Club, Starlight Racing and Head of Plains Partners' Yoshida, already a rare Grade 1 winner on both turf and dirt, returns to the grass in search of his biggest payday yet in the inaugural $7 million Pegasus World Cup Turf Invitational (G1) Saturday, Jan. 26 at Gulfstream Park. First race post time is 11:30 a.m. EST. Post time for the Pegasus Turf is 4:50 p.m. EST. The race will be shown during NBC's live national telecast from 4:30 to 6 p.m.
Yoshida was assigned Post 2 and installed as the 5-2 program favorite among 10 older horses entered during Tuesday morning's post-position draw in Frankey's Sports Bar at Gulfstream. The field features nine group or graded-stakes winners, including Yoshida's Hall of Famer Bill Mott-trained stablemate Channel Maker. Since the same connections also own 2018 Florida Derby (G1) winner and Pegasus World Cup contender Audible, they decided to put Yoshida – out of the Canadian Frontier mare Hilda's Passion – back on grass for the Pegasus Turf. “He's very good. He had been in really great form during Saratoga and Belmont. He won a 'Win and You're In' when he won the Joe Hirsch Turf Classic and we ran in the Breeders' Cup Turf going a mile and a half. Very soggy turf that day, a lot more pace than maybe he had had when he won the Joe Hirsch,” Mott said. “We made the decision collectively to have him in the race that day and I think by doing that we kind of forced his hand a little too much and the turf was very soft and it just worked against him. Bran Jam Stable and David W. Clark's Fahan Mura punched her ticket to the Pegasus Turf with a front-running three-quarter-length victory in the 1 1/8-mile Robert J. Frankel (G3) Dec. 29 at Santa Anita. Also by English Channel, the 5-year-old former claimer is the most experienced runner in the field with 23 starts, nine of them wins. Regular rider Edwin Maldonado returns in the irons from Post 6. 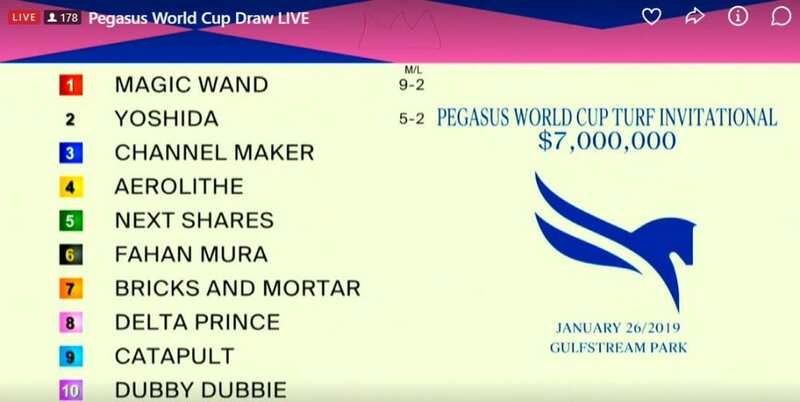 This entry was posted in NL Article, Pegasus World Cup and tagged bill mott, catapult, gulfstream park, john sadler, pegasus world cup turf, winstar farm, yoshida by Press Release. Bookmark the permalink.